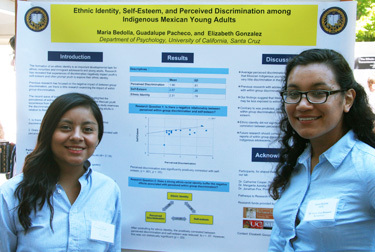 Psychology students Guadalupe Pacheco and Maria Bedolla presented their research on ethnic identity among indigenous Mexican young adults. Erica Bufanda, a Julie Packard Summer Scholar, worked on an astrophysics research project with physics professor Tesla Jeltema. 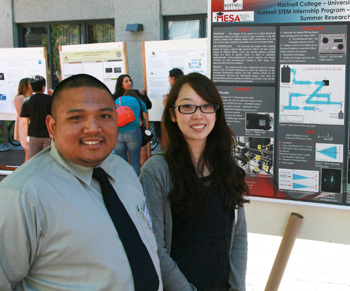 Hartnell College students Rex Niduaza and Annie O presented their work at UCSC on an adaptive optics microscopy project. 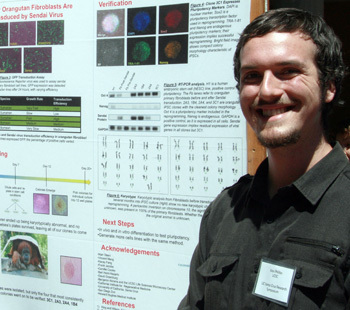 Bioengineering student Alex Phillips created induced pluripotent stem cell clones from Sumatran Orangutan skin cells. 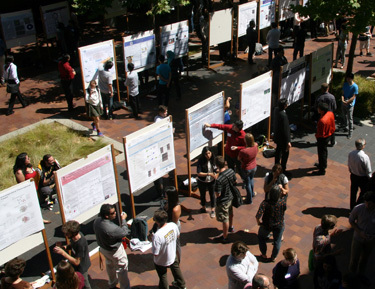 A diverse crowd of undergraduate researchers gathered in the Engineering Courtyard on Friday, August 15, to present the results of their summer research projects. They included UC Santa Cruz students doing research in a broad range of disciplines, from bioengineering and physics to linguistics and psychology. The event also included students from other universities around the country who came to UC Santa Cruz for summer experiences in undergraduate research. Many of the students who presented their work are participants in various programs at UCSC that support underrepresented students in STEM fields (science, technology, engineering, and mathematics), said Malika Bell, director of STEM diversity programs at UCSC, whose office organized the symposium. The STEM diversity programs offer students financial support, mentorships, and research training. The Initiative for Maximizing Student Development (IMSD), for example, supported biology students Kendy Huang and Joanna Perez, who used molecular cloning techniques for their research on RNA binding proteins in the lab of Grant Hartzog, professor of molecular, cell, and developmental biology. 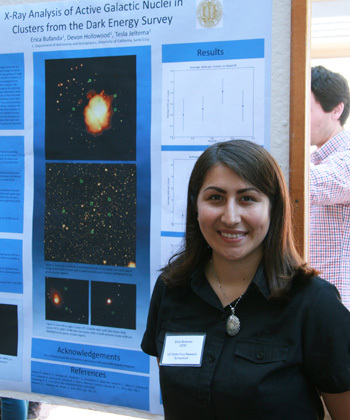 Erica Bufanda, an astrophysics student who presented her research on active galactic nuclei in galaxy clusters, was one of ten Julie Packard Summer Scholars at the symposium. These summer research scholarships for undergraduates are among the student programs supported by a recent gift from alumna Julie Packard to establish the Dean's Fund for Diversity in the Sciences. Several programs bring students from regional community colleges to UC Santa Cruz for summer research internships. Rex Niduaza, a participant in the UC LEADS program, will be transferring this fall from Hartnell College to UCSC. He and fellow Hartnell student Annie O presented their work at UCSC this summer on an adaptive optics microscopy project led by Joel Kubby, professor of electrical engineering. "Before this summer, I had never even heard of adaptive optics or super-resolution, so I've learned a lot," Niduaza said. Other students traveled thousands of miles to spend the summer doing research at UC Santa Cruz. Hannah Becton, an engineering student at the University of South Alabama, took part in the Summer Undergraduate Research Fellowship in Information Technology (SURF-IT), one of two Research Experience for Undergraduates programs at UCSC sponsored by the National Science Foundation. She spent the summer working with computer engineer Gabe Elkaim on technology for animal tracking collars that aims to supplement the collar's battery power by capturing energy generated by an animal's movements. This was the fifth annual Undergraduate Summer Research Symposium, and Bell said participation has grown every year. This year's event featured nearly 100 student projects.